Advocates of the measure say it would make it harder for teens to buy beer, wine and liquor. Supermarket chains say it’s a cynical attempt by a union to fight labor-saving technology. Rob Gokee and Allison Vanore know that buying wine at their neighborhood Fresh & Easy near the USC campus can be something of a production. 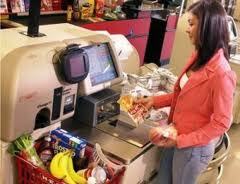 After scanning two bottles at one of the store’s self-checkout stands, all heck broke loose. An alarm sounded. A red light flashed. And the checkout computer froze until a clerk came by to confirm the buyer was at least 21 years old. California politicians, egged on by the grocery clerks union, want to put an end to such four-alarm checkouts. They’re pushing a law that would require anyone buying liquor to conduct business with a human cashier, not a machine. Supporters say the legislation would prevent underage buyers from slipping out the door with beer and bourbon — and keep more cashiers employed. Gokee, 41, said it would just force people like him to wait in longer lines with people who prefer to have someone else scan their purchases. Vanore, his fiance, said that under the present system, there was little chance minors could escape with booze undetected anyway. “I’ve never been able to just pay and walk out the door with it. They still come and look at your ID,” the 29-year-old independent movie producer said.